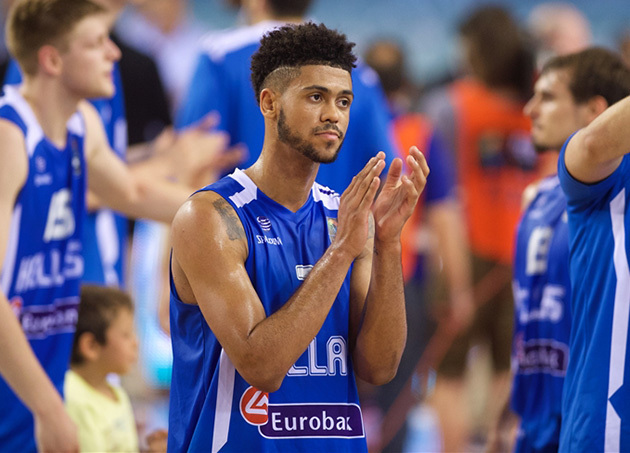 The story of how Tyler Dorsey, a California native, came to star for Greece at the FIBA U19s. HERAKLION, Crete, Greece — On the Fourth of July, a guard born and raised in Pasadena, Calif., who just last year was cut from a USA Basketball tryout camp for its U18 national team, was 7,000 miles from home, on an island in the Mediterranean, leading an attack against an American defense. Goaded on by the frantic gestures of a head coach whose words he could not understand, Tyler Dorsey drove his way to 16 free-throw attempts and 23 points in a semifinal loss at the 2015 FIBA U19 World Championship, where he was the home crowd's most adored player. When some of the Americans first spotted Dorsey at the tournament in Crete, wearing a jersey with HELLAS on the front, they were confused. One player who'd faced Dorsey in California AAU events came up to him and said, "Wait—you're Greek?" The story of how the Oregon-bound recruit, just weeks removed from his high-school graduation, acquired dual citizenship and a new passport, an invite to Greece's U19 tryout camp, and then played his way onto the all-tournament team at the FIBA U19s by averaging 15.9 points per game is serendipitous and heartwarming. Greece's basketball federation, as of four months ago, had not been aware of Dorsey's existence. If not for a tangential conversation between a coach and a journalist, they might never have connected. When Oregon assistant coach Tony Stubblefield traveled to Athens in March, it was for the purpose of recruiting 7'1" Greek center Georgios Papagiannis, who was deciding between signing with powerhouse club team Panathinaikos or heading to college. But during that visit, Stubblefield mentioned something to a friend of his, Nikos Papaioannou, a columnist for NBA Greece: "We've got a kid from Pasadena who just committed"—Dorsey made a verbal pledge to the Ducks in February—"whose mother is Greek. What do you think? Could he play for your national program?" Papaioannou said that if the family had the proper paperwork, they could start the process immediately. He did his own assessment of Dorsey as a player and told Greek federation officials he could be a "game-changer" as a 6'4", attacking guard for the youth program, and eventually the senior program. Dorsey's mother, Samia, still had her Greek passport; she was born to a Greek father and Israeli mother, and lived in Athens as a child before moving to the U.S. when she was 3. Samia tracked down documents proving the Greek citizenship of her late father, Antoine Constantinides, and she was motivated to get Tyler into the Greek program. It would be a good cultural experience for him; it might open up more career opportunities in basketball; but most of all, she said, it brought back memories of her dad. Constantinides and his wife babysat for Tyler when he was a kid, served him Greek food, and when he was five, took him on a month-long vacation to Greece. "My father passed away three years ago," Samia said, "and I knew that he would have been so proud to see his grandson play for Greece." Once the president of the Greek basketball federation, George Vasilakopoulos, gave permission for Dorsey to try out for the U19 team, two officials from the federation fast-tracked the paperwork process. They flew Dorsey and Samia to Athens to finalize it in June. Dorsey received his Greek passport on the Tuesday before the U19s and was added to the Greek roster at the 11th hour before the tournament tipped off in Crete. Although he never started a game—coaches had him come off the bench for a team whose core had been together for multiple years—Dorsey led the Greeks in minutes and points en route to their fourth-place finish. "We were shocked when he arrived and we were told he was Greek," Greece's starting power forward, Konstantinos Mitoglou, a rising sophomore at Wake Forest, said of Dorsey. "But it was good for us. He has the American attitude to his game, to be quick in transition and very athletic. He helped us on rebounds [averaging 5.0 per game] and is good in one-on-one, so we took advantage of that. He adjusted very good to this team." While the Greek head coach did not speak English, and Dorsey did not know Greek, assistant coaches and teammates did enough translating for him to help him learn plays, follow instructions, and occasionally understand when someone was swearing. "I learned a couple of Greek words," Dorsey said. "Yes, which is né, and then a bad word." ​Mitoglou said they taught Dorsey malakas, a slang term that can be used as everything from "dude," to "a--hole," to "stupid." But very little, if anything, that Dorsey did on the court was stupid. He shot 52.4% from the international three-point line and made 57.1% of his twos. And among players who averaged at least 20 minutes per game, Dorsey finished with the second-highest Player Efficiency Rating (PER) in the entire tournament. (Croatian center Ivica Zubac ranked first, and the top American, Villanova-bound point guard Jalen Brunson, was fourth.) Dorsey dropped 23 points on the U.S., 25 on Tunisia and 19 on Turkey. Papaioannou said that when he talked to Greek coaches, they were blown away by Dorsey's maturity level. One even remarked to him that Dorsey "played the game like he was 30 years old." Dorsey did plenty in Crete to revitalize his image as a prospect. There had been concerns that he had peaked early in the grassroots scene, and last summer he was cut after the first day of a minicamp for the U.S. U18 national team, where Arizona's Sean Miller was serving as an assistant coach. ("That was the first time I'd ever been cut from any team," Dorsey said, "so I just used it as fuel to my fire.") Shortly after, Dorsey backed away from verbal commitment to Miller's Wildcats and re-opened his recruitment. Prominent recruiting websites cooled on Dorsey after evaluating his final trip through the AAU circuit; last September, Scout.com dropped him from 10th to 39th in its Class of 2015 rankings, and ESPN dropped him from 7th to 33rd. Both sites downgraded him from five stars to four, and he was later passed over by the selection committee for the McDonald's All-American Game. Playing for Greece in the U19s, Dorsey proved he could thrive in a structured setting, without having to dominate the ball. While he didn't succeed in convincing his roommate, Papagiannis, to sign with Oregon—the big guy chose to get paid by Panathinaikos instead—Dorsey did offer the Ducks proof that he could be an immediate asset as a wing scorer in 2015-16. Dorsey showed a remarkable level of patience coming off the bench and picking his spots in a European offense; he was poised despite the communication difficulties; and he gave the Greeks major boosts as a floor-stretching catch-and-shoot wing as well and a low-to-the-ground, foul-drawing basket-attacker off the bounce. The only thing Dorsey seemed overwhelmed by was the adoration from Greek fans. He came off the court each day at the U19s beaming as children (and a good number of adults) in the stands begged him for autographs. "These people didn't know him [before the tournament]," Dimitrios Pitsoulakis, a Greek radio reporter covering the tournament, said of Dorsey, "but now, they love him." The fans in Crete blew horns after Dorsey's buckets, and the PA announcer began drawing out his name longer and longer, for effect: TY-LERRRRRR DOR-SEEEEEEEEE!!!! Arena workers and volunteers stopped him for selfies and group pictures. His Twitter notifications feed swelled with the Greek alphabet. Oh, and also, according to Dorsey: "I'm not totally sure, but I think a girl in our hotel lobby said to me, 'I want to marry you." He rolled with it, answering with his one good word: né. Dorsey promised the Greeks that he would speak more of the language the next time he suits up in a HELLAS jersey, which he said would most likely be at the European U20 championships in 2016. He flew back to California on Tuesday for a brief reunion with his mother before he enrolls at Oregon. Samia Dorsey watched the entire U19s from Pasadena on FIBA's YouTube live-streams, and less than an hour after the tournament ended, she Tweeted out a picture of Tyler as a baby, in the arms of his late, Greek grandfather, Constantinides. As well as the U19s went for Tyler, Samia said that for her they were bittersweet. Her boy, not just playing but starring for Greece? It was a dream, but she knew that no one would've enjoyed it more than Constantinides.